Democrat Dianne Feinstein is projected to win a fifth term representing California in the U.S. Senate fending off a challenge by state Sen. Kevin de Leon, D-Los Angeles, who managed to upset the status quo by forcing a runoff and gaining the backing of the state Democratic Party. Although the first returns released by the state showed de Leon with a small lead, it quickly evaporated as ballot counting continued, with Feinstein gradually increasing her lead with each new tally. Feinstein has represented California in the U.S. Senate since 1992 and is widely viewed as a centrist Democrat, but a shifting electorate and de Leon’s more progressive stance forced the 85-year-old politician to move to the left on the death penalty, recreational marijuana and fracking. That and a campaign budget that dwarfed de Leon’s — her campaign had $4.2 million in cash available as of Oct. 17, while he had just under $300,000 – – helped give her what seems enough of an edge to win. 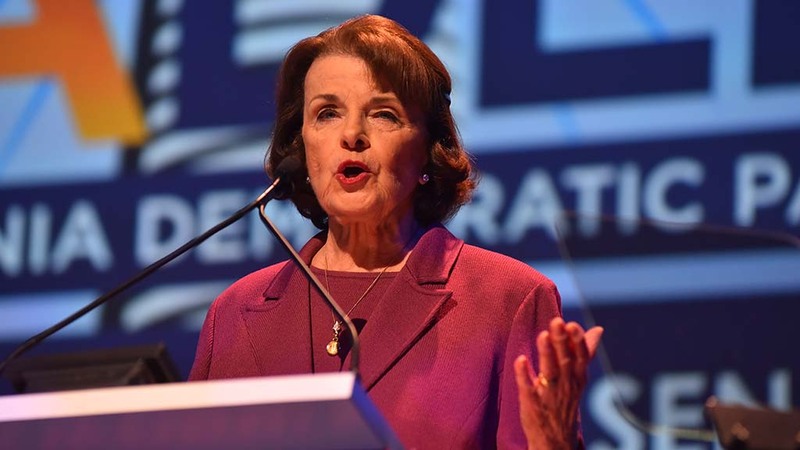 A final pre-election poll by the UC Berkeley Institute of Governmental Studies showed Feinstein leading de Leon 45 to 36 percent, while a mid- October poll from the Public Policy Institute of California had the senior senator ahead by 16 points. In both polls, Democrats favor Feinstein at least 2- 1, while independents favor de Leon. Up to half of Republicans say they either will not vote in the race between two Democrats or are undecided. De Leon, 51, represents the state Senate’s 24th District, which encompasses downtown and East Los Angeles. He has sought to position himself as the more liberal, more progressive choice for Democrats, and one who will be a tougher critic and enemy of President Donald Trump on issues ranging from health care to climate change. Despite those remarks in the first year of Trump’s presidency, Feinstein has since largely tracked with Congressional Democrats in opposing Trump’s policies and highlights that opposition when campaigning. Her front-and- center role in opposing Judge Brent Kavanaugh’s nomination to the Supreme Court also burnished her liberal credentials while drawing the wrath of Trump supporters. Feinstein is perhaps best known as a strong advocate for gun control and for being the author of the 1994 Federal Assault Weapons Ban, which expired in 2004. She became mayor of San Francisco when Mayor George Moscone and Supervisor Harvey Milk were shot in City Hall in 1978. She has made gun control a focus of her campaign at a time when the issue has been a national talking point in the aftermath of several mass shootings. Both candidates support universal health care, but de Leon backed a push to create a single-payer system in California, something Feinstein doesn’t endorse. Her record on immigration rights includes her Keep Families Together Act, which aims to end the practice of separating children from parents at the U.S.-Mexican border, and she sits on the Senate committee responsible for immigration reform. De Leon introduced California’s “sanctuary state” bill, which is supported by a majority of California voters, particularly in Los Angeles, San Francisco and San Diego counties. Feinstein had the endorsement of Gov. Jerry Brown, gubernatorial candidate and Lt. Gov. Gavin Newsom, Los Angeles Mayor Eric Garcetti and the Los Angeles Times, among many others. But she was snubbed by the state Democratic Party, which endorsed her opponent. De Leon also has the backing of more labor unions, including the powerful California Labor Federation and Service Employees International Union, as well as many of his colleagues in the Senate and other state, city and county officials. La Opinion, the largest Spanish-language newspaper in the country, has also endorsed him. In the only debate between the two candidates, Feinstein sought to claim her experience as an asset, while de Leon argued that politicians in Washington lacked courage to take action on critical issues such as immigration reform and climate change. In addition to serving as the ranking member of the judiciary committee, Feinstein’s seniority in the Senate affords her key seats on the intelligence and appropriations committees. Characterizing herself as a veteran of partisan infighting, she positioned herself as better able to step up if Democrats regain control of the House.